The Lizzadro Museum of Lapidary Art has a special treat for you called The Rock Café. You can see this ongoing exhibit from the Lizzadro’s permanent collection through Friday, May 31 during regular museum hours. The Rock Café offers visitors the opportunity to see three complete meals composed entirely of shaped and polished stones. It doesn’t sound very tasty, but just wait until you see it! The Rock Cafe looks so delicious, the museum has posted a warning that reads: “Eating rocks will lead to broken teeth!” All of us at Elmhurst Toyota think this exhibit is a must-see. It will appeal to everyone, from the most experienced lapidaries to young children. The Rock Café features a complete breakfast, lunch and dinner. 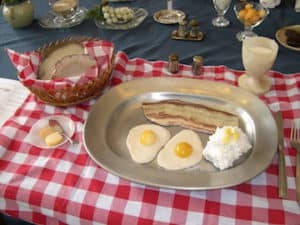 The hearty breakfast includes striped onyx marble bacon, two sunny-side-up eggs with golden Mexican onyx yolks, and a side of aragonite grits. Following this Paul Bunyan-style breakfast, there’s a light lunch or midday snack of Mexican onyx fruit salad, cheese made of feldspar, and a glass of ice water with calcite ice cubes. Dinner is a gourmet’s delight. The meal includes caviar and crackers made of black onyx and quartzite, a petrified wood steak and a spinach soufflé made of green jasper. Dessert consists of gelatin squares made of fluorite. The Rock Café was created by Sylvia Josefek, who lived in North Riverside for more than 50 years with her husband Paul. Both were lapidaries active in the Earth Science Club of Northern Illinois. After Sylvia’s passing in 2008, her children donated The Rock Café to the Lizzadro Museum. Senior (ages 60 and older) admission is $4. Student and teen admission is $3. Child (ages 7-12) admission is $2. Children under 7, Lizzadro Museum members and active members of the Armed Services receive free admission.